Hey hey! 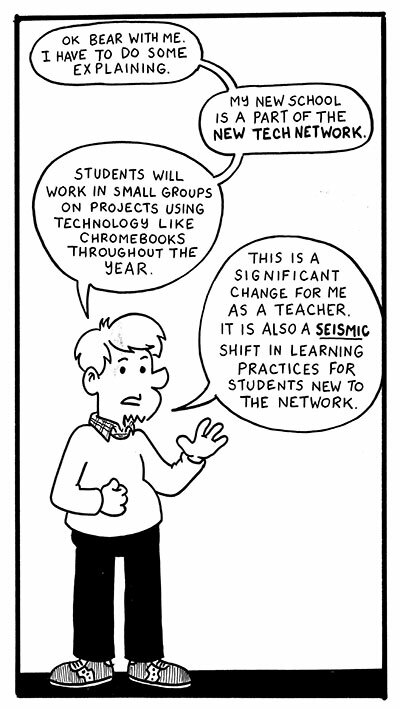 My newest comic is running in the latest issue of Ohio Schools Magazine! In it, I talk about the Friedrichs v. California Teachers’ Association case. I’ll post a better scan tomorrow, but for now… here it is! Pfft, like I have an ego. I only draw a comic about my job and have an art gallery up in my room of drawings my students have drawn of me over the years. I apologize for the info dumps that will happen periodically throughout this run of comics. I try not to be overly explainy when I’m doing strips, but this whole system is so new to me I can’t help it. This comic will also lead into tomorrow’s. For awhile now, I’ve been getting requests for a print version of Teachable Moments. A week that goes by without someone asking me about where they can buy a book or a comic collecting all my strips is a rare one. I’ve been a little gunshy about the prospect but… I can finally say, readers have at long last lovingly worn me down. 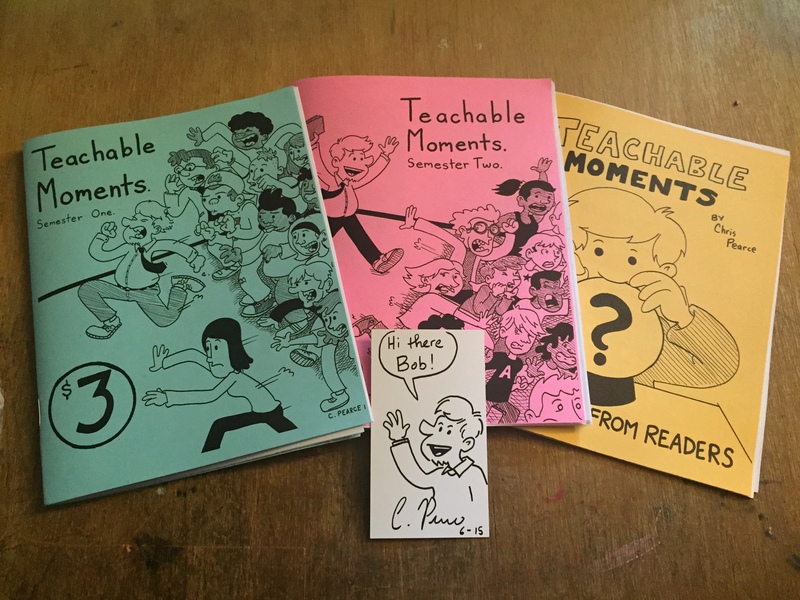 For the first time ever, you can purchase Teachable Moments as a two part ‘zine experience! Collectively covering a years’ worth of teaching journal comics, each book is 28 pages and is ready for purchase! Now I know the deal – a lot of people SAY they’d be interested in XY or Z… but when the opportunity comes to buy X or Y or Z, those same people want to wait for a bargain of some kind. Well readers, wait no more because I have a bargain for you! …so that’s a great bargain right? Well wait, it gets better. If you buy now, you’ll also receive Questions from Readers, a 12 page ‘zine I created exclusively for folks who have been reading my comic on Tumblr and my WordPress blog. Occasionally I’ll ask you all if you have any questions for me and I’ll turn those into comics. I’ve collected the best of those here. 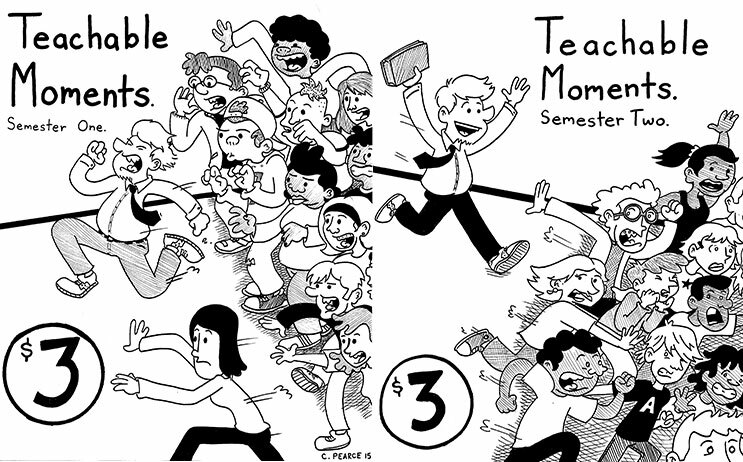 That’s three ‘zines for $10 bucks… but wait, there’s more! I will also include a mini-doodle on the back of a business card! That’s right, a tiny little doodle… just for you! You can ask me for something small or I’ll just draw you whatever comes into my head. If your name is “Bob” you can have the one I drew in the picture up there, plus another one free of charge. Please peruse my Etsy store for more details or send your $10 dollars directly through PayPal to chrisalanpearce@gmail.com. I will be sending off the first batch on Monday of next week. 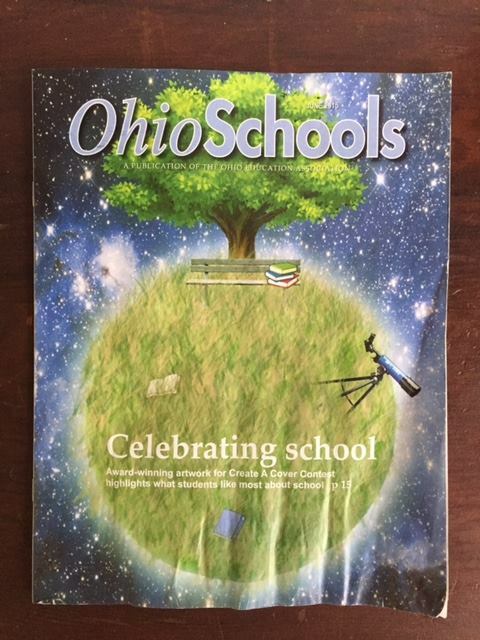 Here’s a full size version of the comic Ohio Schools Magazine is running this month. 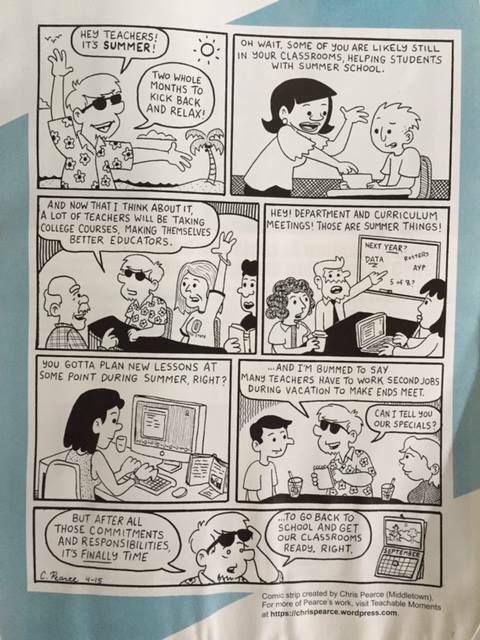 Teachers have it easy during summer vacation – Teachable Moments in Ohio Schools Magazine! Hey, I forgot to tell you all! 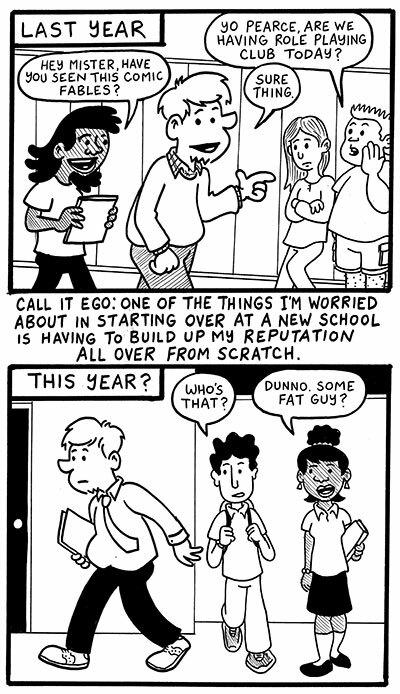 Ohio Schools Magazine printed a brand new comic by yours truly in their Summer 2015 issue! I seriously don’t know how this slipped my mind. 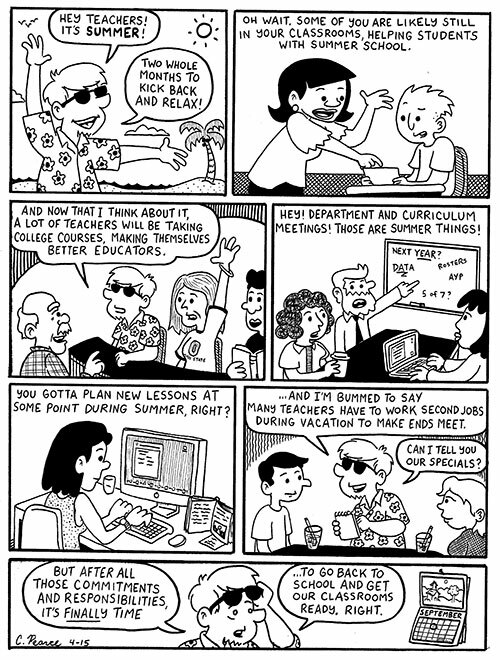 It’s all about how soft we teachers have it with summer vacation. Previous to this issue, Ohio Schools had reprinted earlier material I’ve posted here on blog and my Tumblr; this is the first time I’ve created new content for them! My copy got a little soaked in our mailbox but you can check out a hi-res version over on Ohio Education Association’s website here. People, please get your $6 dollars ready (plus a little extra for shipping and handling). You are currently browsing the archives for the 2014-2015 school year category.